Eddy current test procedures with premagnetization have been developed for detection of internal and external damages in tubes made from ferromagnetic materials like carbon steel, low-alloy steel, duplex or nickel alloys. The central item for this specific challenge are test probes that were especially developed for this task, which can detect local as well as extensive corrosion, cracks and all known erosion types and differentiate between them. Even damages near by or under vulnerable support plate areas can be determined, and their depth can be identified with fair accuracy. This is a decisive advantage compared to competing NDT procedures like remote field tests (RFT) for instance. Test speeds of up to 70 tubes per hour (average 30 to 40 tubes per hour) can be achieved. Even damages like cracks and corrosion in the tube sheet area are detected with special rotating probes. 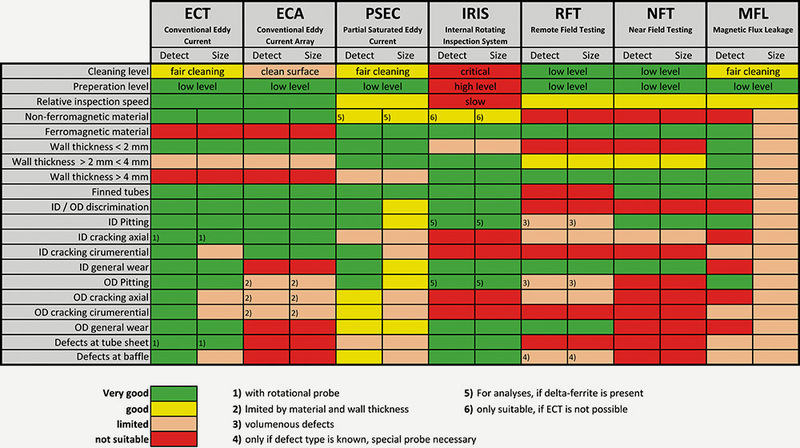 Fair tube cleaning is still necessary, but by far not as critical as for IRIS testing. Only magnetic and electrical conductive deposits must be removed from the tubes ́ interior. Probe access with 1 mm undersize across the entire tube length must be ensured. Several types of defects present at the same time make interpretation of the eddy current signals more difficult. For this reason, experienced inspection personnel is required. The depth of external defects can only be determined by signal amplitudes compared to conventional eddy current. The test accuracy resulting from this can be slightly below that of conventional eddy current procedures (depending on the tube material, tube dimension and type of defect).